Amund's first released level is actually one big outdoor area with some ruins and lots of rocks. Outdoor design is very good looking and shadows are realistic. Texture usage is simple - canyon rocks, green grass & red sky. Combination works very well. Terrain looks very good and rich. The ruins of some old castle looks good even it could have used a bit more details to make it look a bit more 'destroyed'. However there are some serious design flaws - invisible barriers. No matter how many times I mention them in my reviews people still keep doing them. Invisible barriers look ridiculous and are annoying. A fence is the answer here - definitely. Another unfortunate thing is the gameplay which is below average thanks to item placement. There are only four weapons available around the level and two of them are completely useless against bots. Level is pretty large so it could have used a lot more weapons. Level is also lacking a lot of health. There's only one place where you can get health. For example the area with ruins could have used a lot more items such as health. Perhaps it's just my taste but I prefer Q3A type levels where you can get health & weapons fast. 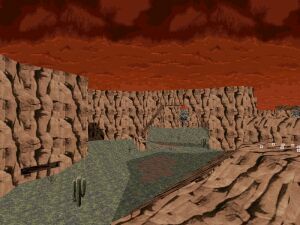 However the design is still sweet and I'm sure that those who can play this level online will get a lot more out of it. A very good first map.